Set in a academy, the Baudeaires may have to face their toughest challenge yet! When the Baudelaires are heading off in Mr.Poe’s car to a boarding school after they had been at a terrible mill they were being sent off to school with a: weird headteacher, a girl with attitude and S.O.R.E. This Book is kind of terrifying, if I was a Baudelaire child then i would run for it! They are so brave and Lemony Snicket has got a true talent for writing, it is unbelieveable! And those Violin Recitals, S.O.R.E! I Could not close my mouth for 30 minutes when Count olaf and his theatre troupe kidnapped the Quagmires and drove them away at the end! Five Stars! 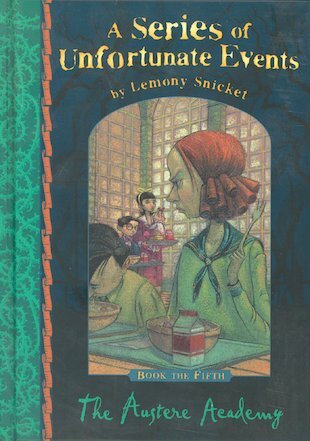 This was the first “A Series Of Unfortunate Events” book I ever read. At the start Violet, Klaus and Sunny Baudelaire attend a boarding school called Prufock Prepatory school and you think that they are going to have a wonderful time and make lots of friends and their teachers would be kind, But Carmalita Spats is one of the things gone wrong. she is horrible to them and calls them cakesniffers. Their Horrible Principal Nero makes Sunny work for him Making Staples all day and they have to live in a tin shack with dripping fungus and snipping crabs but it gets better and they make friends with The Quagmires, But don’t calm down yet! One day there is a new Gym teacher with a turban, but when the Baudelaires look closely they realize it is their Evil and Woeful Guardian, Count Olaf, The rest is just to Ghastly to explain!